Fear of intimacy is one of those tropes that’s so common it’s practically become cliché (Friends was on at the gym the other day, and I couldn’t help but to roll my eyes at Chandler trying to run away from his wedding), yet its based on very real, very understandable fears. Without intimacy one would lead a very lonely life, yet opening yourself up to another person is, ultimately, a risk that takes a surprising amount of courage to do. That’s something America Chavez has already discovered in America 5, an issue that shows the benefits of her emotional intimacy even as this same quality places her in grave danger. The true emotional intimacy here is shown between America and her BFF Kate Bishop, a.k.a. Hawkeye. 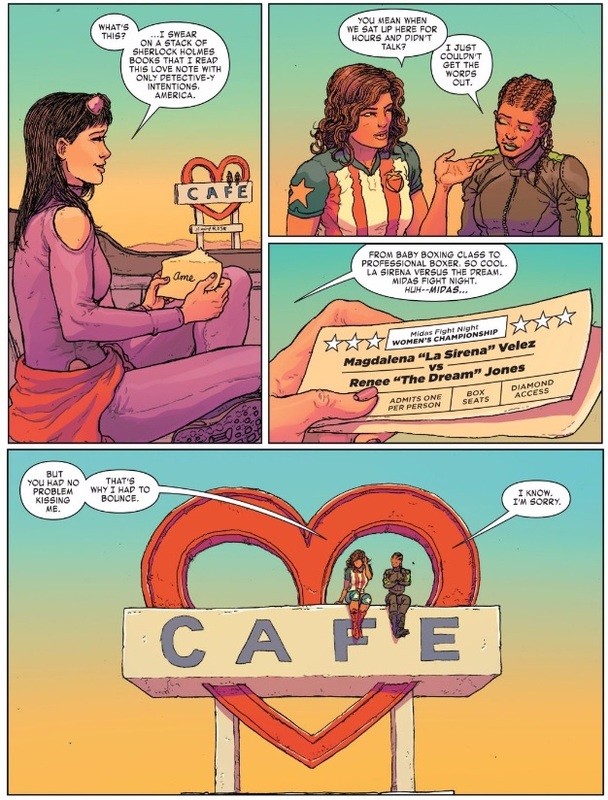 Gabby Rivera, Kelly Thompson, and Ramon Villalobos create a truly sweet relationship between these two former-Young Avengers, showing how far they go to spoil each other, while also forcing each other to take down their emotional walls. So much of the joy in this issue just comes from Kate and America’s rapport as they road trip across the country singing Gwen Stefani songs, but it’s to Kate that America is also able to turn for help in the ongoing case that’s followed her across the past four issues, as well as finally tell the story of her kinda-sorta teenage ex, Magledena Velez. It’s clear that these two women being open and honest with each other is a very good thing. In contrast, America and Magledena didn’t work out exactly because Magledena couldn’t open up to America. It strikes me as remarkably mature of 15-year-old America to realize that this kind of fear wasn’t a good foundation for a relationship. Regardless, as an adult Magledena is able to admit her feelings to America in a way she never could before, and America rewards it with a kiss. Unfortunately, this time it doesn’t pay off. Being intimate with someone is always a risk, and inevitably somebody will betray your trust. That doesn’t mean it’s not worth doing, though. After all, Magledena may have put America in danger, but Kate Biship ends the issue rushing to America’s aid with everything she’s got. A friendship like that is worth every one that fails. The big problem with McKelvie falling in love with what was supposed to be one shot look that was specifically not her superhero costume but merely an excuse to reference, if I remember correctly, one of Emma Peel’s outfits in the Avengers (the British TV Show, unrelated to superheroes, to be clear), was that it left us those damn holes, that are the worst part of an otherwise great costume (much, much better than her first costume, even if I miss the scarf at times). I really love Kate’s current look, but I wish more artists used McKelvie’s version, instead of Aja’s. Especially since Aja’s version was never supposed to be a superhero costume. And yeah, I always love when thought is given to the texture of the costumes, instead of just going for spandex. It always looks so much better, and it helps build character. Just like you, I think this is one of the best depictions of Kate’s costume, and part of it is that the leather is fitting for Kate. It feels more practical, like an outfit Kate has actually considered. Wow, this is a massive improvement. Part of it is Villalobos, whose art does such a great job at making the everything feel like part of the same world, instead of that seemingly disconnected feeling I had with Quinoes. But the writing is also much better. The easy explanation would be that it is all done to Thompson, but I think that is unfair. I think a lot of it comes down to Rivera. Ultimately, the biggest difference between this arc and the last arc is the fundamentals. The last arc lacked focus and was paced far too fast, but both of these problems are solved. The book slows down for once. In true road trip style, it is all about the journey, which is something previous issues missed. And instead of trying to be a comprehensive look at all things America, it narrows down to just her love life, focusing instead on America’s love triangle with Kate and Magdalena. And I use love triangle with purpose. I am not necessarily saying that Kate and America have romantic feelings for each other (though I also wouldn’t be surprised if this is the case*), I think intimacy actually is too light of a word to describe this issue. I think it is very clear that their relationship, whether romantic or friendship, is love. Which is key, because it holds the metaphors of this issue together. After last arc, America is feeling lost and alone, needing connection and love. There are many reasons, ultimately all metaphors for America’s break up with Lisa. Kate is there for her, literally summoning her to LA and giving America the love she needs. Meanwhile, America gets entranced by the nostalgia presented by the one who got away. The nostalgia of that love is beautiful, but it ignores the problems. Ultimately, Magdalena wasn’t a good partner, who hurt America. The fact that she’d never let America fly her up there, or the fact that they couldn’t communicate. And the ending brings these truths that America has let nostalgia blind her to actualise. Kate, solving the case, shows how she is always looking out for America/giving her the love and support she needs. While Magdalena, as always, just hurts America. In a more literal way than before, but hurts her just the same. 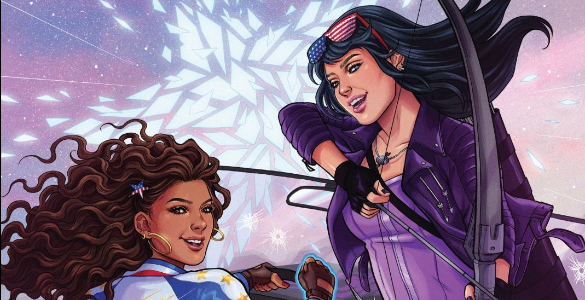 America, blinded by her nostalgia form both Magdalena and Lisa, is going to have to realise that the love she needs right now has always been just in front of her, in the shape of her badass archer friend who she went on an awesome roadtrip with. This comic finally came together, and oh boy, did it do a great job at it. I was this close to dropping the book, deciding to use Marvel Legacy as the point to make the decision. But if America can keep up this quality, I’ll be staying. A great issue. *After the ending of Gillen’s Young Avengers, it is pretty much inevitable that Kate and America would get together at some point. Writers like Whitley certainly haven’t tried hard to hide that. And this story arc could quite easily be the one. Firstly, it is a love story between America and Kate, and secondly, Kelly THompson is cowriting this, which is not typical for a guest character. Suggests Rivera may have wanted Kate’s current writer involved for a reason.